What should your child learn? Need special services for your child? Due to a recent Office of Early Learning audit finding, we have modified our screening calendar. Beginning February 6, 2019, ASQ "Due Letters" will be uploaded every week to your Provider Portal, rather than every two weeks. This way, providers will have 30-days notice before the screening due date. All providers should have received an email with more information on this finding. If you have any questions or need assistance, contact Program Coordinator – Trellanie Jordan, tjordan@elcduval.org, 904.208.2044, ext. 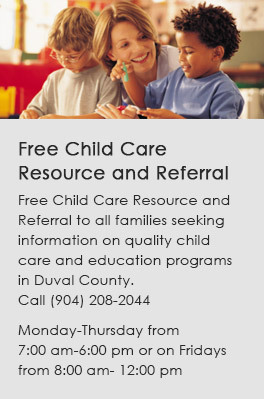 229 or Danielle DeCastro, ddecastro@elcduval.org, 904.208.2044, ext. 253.